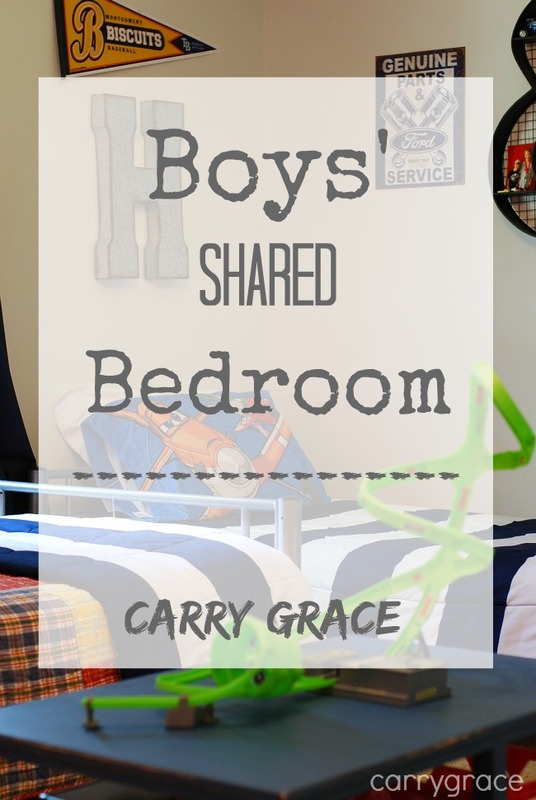 I shared a peek at my boys' room EIGHT months ago on my YouTube channel. I had big plans to finally start getting some things on their walls. I had a few things in mind, but for whatever reason I drug my feet on this one. I couldn't seem to commit to anything. 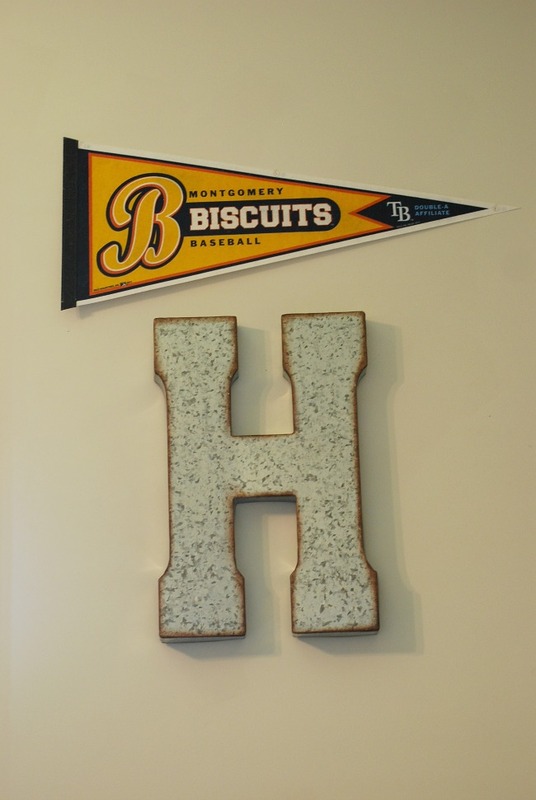 The first thing I purchased were two of the large galvanized letters from Hobby Lobby. I got one to go above each bed. And then I was stuck again for a few months. 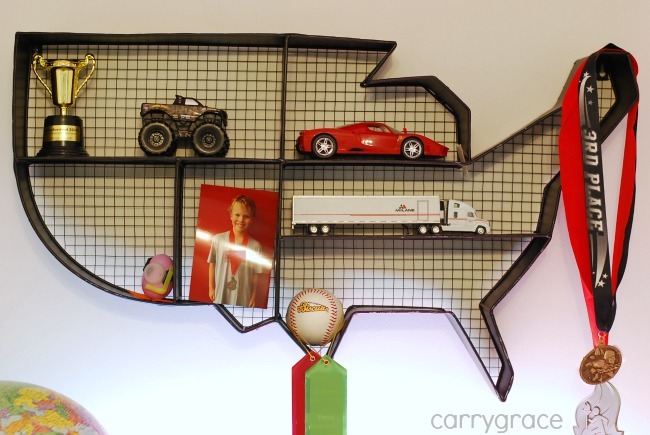 One day I was in Hobby Lobby and noticed a metal shelf in the shape of the United States. It was 80% off. I purchased it with the intention of using it in my boys' playroom to display Lego creations. 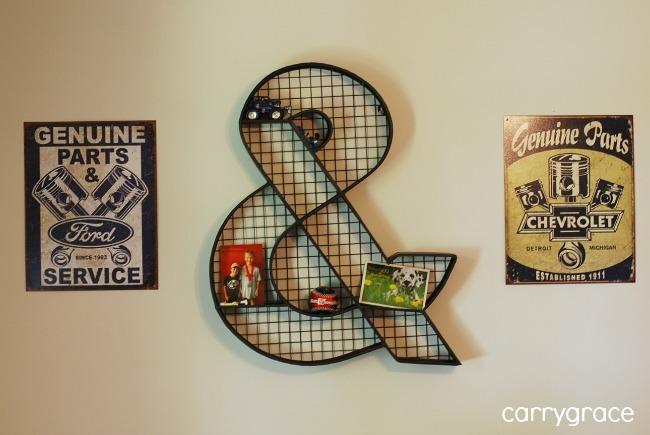 Two days later, I found a similar metal ampersand shelf for 80% off. 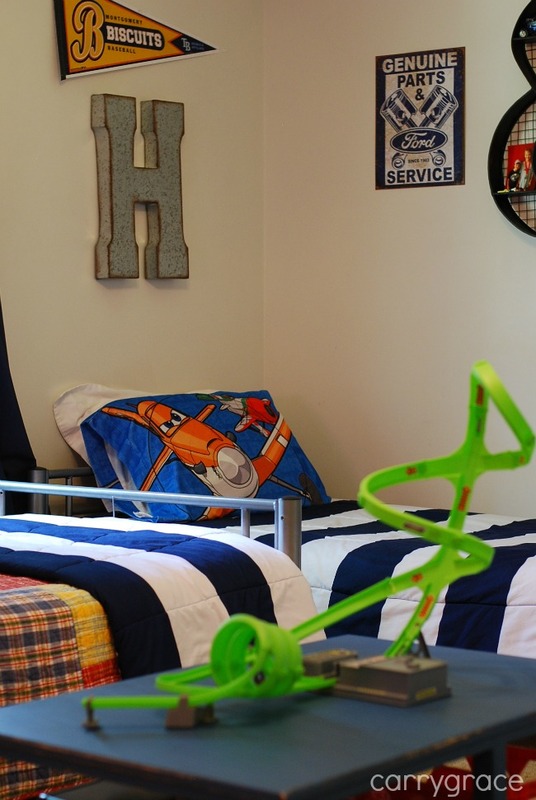 Two metal shelves meant that each boy could have one of their own for their personal items. I finally had the inspiration I needed. I didn't want a strong theme in their room, but instead decided to stick to classic timeless things. Stripes, metal, baseball, cars...you get the idea. The ampersand was perfect paired between two metal car signs. It really filled the wall up nicely. 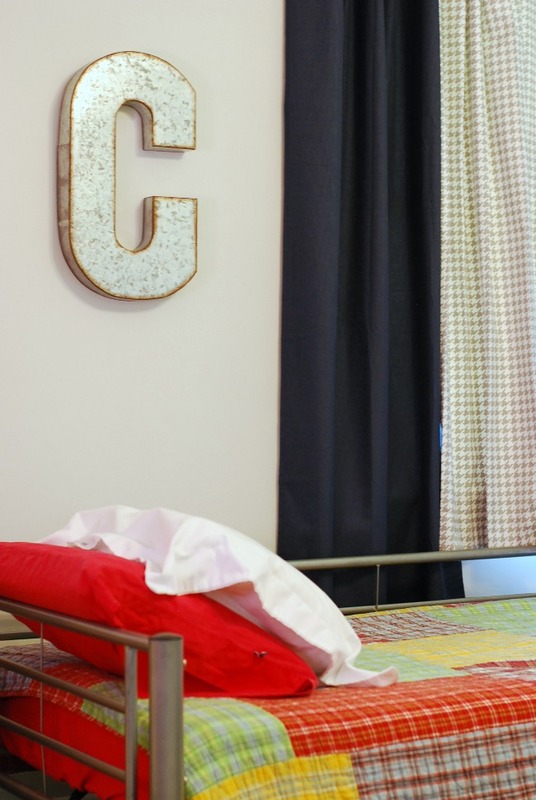 They both have matching striped bedding that was purchased from Target, but they opted to add their own favorite elements with a quilt and different pillow cases. I didn't think I would like it, but I really do. My favorite thing that changed in the room is the coffee table. 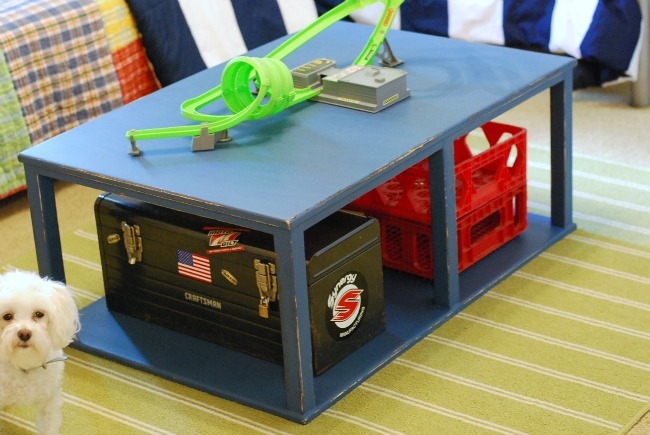 My husband built this table for the boys several years ago when they outgrew having a train table. We originally stained the table, but I was ready to paint it. I chose the paint color by shopping my stash in the garage. I have no idea what color this is. It is leftover paint from a client project. I sanded the edges and roughed it up a good bit. I know it will take a beating. I am so happy to have this room done! The only thing I have left to do is find something for Cade to hang over his nightstand for all of his swimming medals and ribbons. I just haven't found the right thing yet. Tucker hung out in here with me the whole time I was taking pictures. I guess it is his room, too. 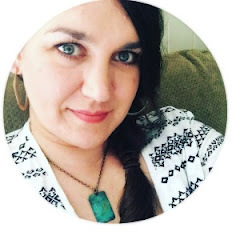 Be sure to check out the video tour to see more of the room.